← Toontrack announces Seventies Rock EZX! 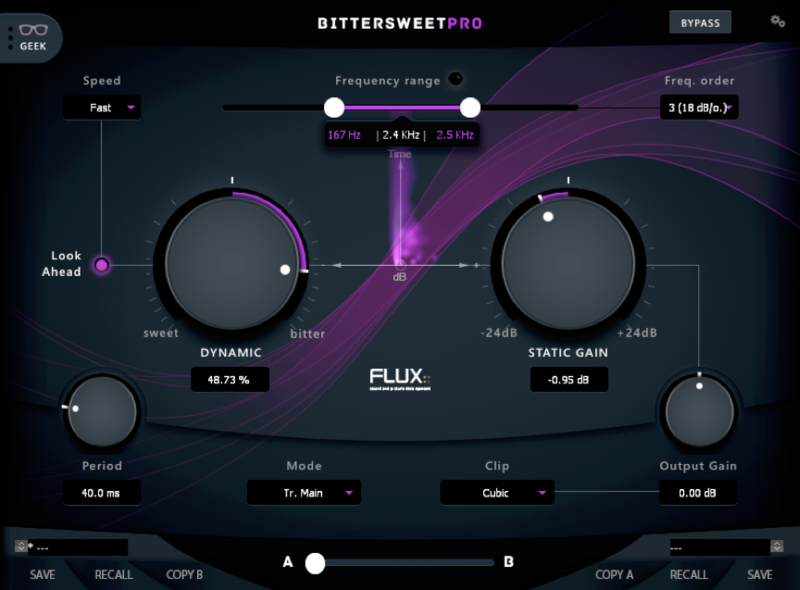 Flux:: release ‘BitterSweet Pro’ – The Ulitmate Frequency Dependant Transient Designer! Flux::, professional audio plug-in manufacturers, announce the arival of their next generation transient shaping tool… BitterSweet Pro! BitterSweet Pro is available on special promo at ‘ONLY’ $99 through Wednesday 31st May, 2016! Purchase directly from The DontCrack Store. It is also included in the newly updated Flux Full Pack (version 2.2). The bundle is currently on sale at The DontCrack Store. ‘ONLY’ $599! Previous owners of the pack will receive an e-mail from Flux with a new activation code for their iLok accounts, as a FREE upgrade!!! BitterSweet Pro is a ‘Frequecny Dependent Transient Designer’, the first of its kind, built on an advanced and improved algorithm design of that found in the acclaimed first generation BitterSweet freeware plug-in, used by hundreds of thousands of engineers and sound designers around the world. What is a Transient Designer? A Transeint Designer is in its basic form a tool to manipulate the attack and/or sustain portion of a sound source. Originally designed by Rubin Tilgner for Sound Performance Labs, it makes use of combined VCA’s (voltage conrolled amplifiers) and Envelope Followers to increase or decrease amplitube at the transient stage or sustain/tail. This can create some exciting application control for drums, guitars, bass, vocals, and for use in mastering. It is considered a staple and essential unit in any professional studio. Adavanced features via the ‘Geek’ panel. Make your drums cut through the mix, sound punchy, alive and have energy to drive a song by increasing the amplitude of their transients directly on tracks or in parallel for ease of automation in sections. Soften transients to make a kit sound more roomy, dampen Snares (and their ring) or Toms by reducing their sustain whilst using the freqeucny range to fine tune tone processing. As a compressor can effectively extend notes by raising lower level audio, so too can BitterSweet Pro by increaing sustain. But again, what’s great with this plug-in, is that you can set a frequency range to enact this process and say for example extend low-end in a Rock driven track, or in advanced use automate the frequency range for each note and sculpt the sound at the fundemental or harmonics, add exciment, beef up a guitar solo. Flavour your room mics, increase the apparent size with sustain, enhance and excite the ambience with transient attack, and virtualise reflective materials at selective frequencies. Flux:: have also been hard at work creating a new and exciting download manager, ‘Center’. No longer will you have to scour the Internet to find an installer or worry about finding one for the format you require for your DAW! A simple and ergonomically deisgned application, Flux:: Center allows you to set options for the format you need, automatically download updates, or manually update at the click of a button. This entry was posted in Audio Software, Plug-ins, Promotions and tagged AAX, AAX DSP, AU, envelope shaper, Flux, Mac OS X, Merging Technologies, Merging VS3, Plug-In, Transient Designer, VST, Waves WPAPI, Windows. Bookmark the permalink.